Launch of a new report by Barry Carin and Gordon Smith, Centre for Global Studies, University of Victoria. Free. Registration is not required. Presentation of the report will be in English; discussion period in English and French. A talk by Jana Hönke, Free University Berlin. Co-sponsor: School of Political Studies. Free. Registration is not required. This event will be in English. A talk by the Honorable Gareth Evans, Co-chair, International Commission on Nuclear Non-proliferation and Disarmament. Free. This event will be in English. Pre-registration is required: RSVP by clicking here. Celebrate the launch of Professor Jacqueline Best and Professor Matthew Paterson‘s new co-edited volume, Cultural Political Economy (Routledge, 2010). A talk by Mark Blyth, Brown University. A talk by Stathis Kalyvas, Yale University. A talk by Andrew Hurrell, Oxford University. A talk by Matthew Levitt, Stein Program on Counterterrorism and Intelligence, The Washington Institute. Co-sponsor: Canadian Academics for Peace in the Middle East. Obama’s Foreign Policy: ‘Yes We Can’ or ‘No We Can’t’? A talk by Stephen John Stedman, Stanford University. Co-sponsor: Canadian International Council – National Capital Branch. A talk by Andreas Wimmer, University of California, Los Angeles. A talk by Eliot Cohen, Professor, Johns Hopkins University and SAIS, and Former Counselor, U.S. Department of State. Co-sponsors: Graduate Scool of Public and International Affairs; Canadian. Association for Security and Intelligence Studies. A talk by Barry Rubin, Global Research in International Affairs Center, Interdisciplinary Centre. Co-sponsor: Israel Scholars Network . A talk by Christina Hellmich, University of Reading. Co-sponsor: Graduate School of Public and International Affairs. A talk by Michael O’Hanlon, Brookings Institution. Book launch featuring Adam Chapnick, Canadian Forces College. Co-sponsor: the Canadian International Council – National Capital Branch. The UN Security Council : Can an Elected Member Like Canada Really Hope to Make an Impact? A talk by Colin Keating, Editor in Chief of Security Council Report. Mr. Keating will be introduced by Mr. Allan Rock, President of the University of Ottawa. A talk by Aurélie Campana, Université Laval. Free. Registration is not required. This event will be in French. Co-sponsor: the African Study and Research Laboratory . A talk by Jason Lyall, Yale University. A talk by Margaret Biggs, Canadian International Development Agency. Free. Registration is not required. This event will be in English and French. India and China in the World Economy: Conflict, Competition or Collaboration? A talk by Louis Pauly, University of Toronto. Co-sponsor: Graduate School of Public and International Affairs and CN-Tellier Chair in Business and Public Policy. A talk by David Carment and Yiagadeesen Samy, Carleton University’s Norman Paterson School of International Affairs. Climate Change: What Does it Mean for Our Security? A talk by Frances Wood, British Foreign and Commonwealth Office. A talk by Stefano Porretti, World Food Programme. Free. Registration is not required. This event will be in English and in French. A talk by Caty Clement, Geneva Centre for Security Policy. Free. Registration is not required. This event will be in French and English. Reform of the US Intelligence Community: What Was Intended, and How Well Has It Worked? A talk by Margaret Henoch, Former Senior Operations Officer, CIA Clandestine Service. A talk by Brigadier General Jonathan Vance, former Canadian commander in Kandahar. A talk by Rex Brynen, McGill University. A talk by Peter Bell, Hauser Center for Nonprofit Organizations, Harvard University. 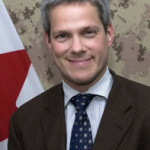 A talk by Dennis Horak, Canada’s Chargé d’Affaires to the Islamic Republic of Iran. A talk by Stephen Carter, University of New Brunswick. A talk by Vincent Pouliot, McGill University. The RCMP and Terrorism: Have we Come Full Circle? A talk by Paul Kennedy, Chair of the Commission for Public Complaints Against the RCMP. Co-sponsors: Graduate School of Public and International Affairs; Canadian. Association for Security and Intelligence Studies. A talk by Anthony Cordesman, Centre for Strategic and International Studies, Washington, D.C.
A talk by John Schoeberlein, Harvard University. Dangerous Communities: Local Political Milieux and the Persecution of Jews in Occupied Poland. A talk by Jeffrey Kopstein, University of Toronto. Climate Change: A Mainstream Security Issue for Canada? A talk by Margaret Purdy, University of British Columbia. Co-sponsors: Graduate School of Public and International Affairs; Canadian. Association for Security and Intelligence Studies. A talk by Adam Roberts, Oxford University. A talk by Thomas Carothers, Carnegie Endowment for International Peace. The Migration-Development Insecurity Nexus: What Insecurity, and for Whom? A talk by Marianne Marchand, University of the Americas, Puebla, Mexico. Co-sponsor: the School of Political Studies. A talk by Michael Small, Assistant Deputy Minister, Department of Foreign Affairs and International Trade. Followed by a discussion facilitated by Peter Jones, University of Ottawa. A talk by Marie-Lucie Morin, National Security Advisor to the Prime Minister of Canada. Co-sponsors: the Graduate School of Public and International Affairs and the Canadian Association for Security and Intelligence Studies . A talk by Irene Khan, Secretary General, Amnesty International. Co-sponsor: Amnesty International Canada; Graduate School of Public and International Affairs, University of Ottawa. A talk by Asher Susser, Tel Aviv University. Co-sponsor: the Graduate School of Public and International Affairs (GSPIA). Location: Desmarais Building, 55 Laurier Ave. E., 12th floor, Room 12110. Full-day event. By invitation only. For information, please contact [email protected]. A talk by Ben Rowswell, Representative of Canada in Kandahar. A talk by Dr. David Kihumuro Apuuli, Director General of the Uganda AIDS Commission. Co-sponsors: the Institute for Population Health, the Canadian AIDS Society, the Interagency Coalition on AIDS and Development, and the International AIDS Vaccine Initiative. A talk by Captain R. Robinson Harris, Lockheed Martin MS2 Integrated Defense Technologies. Co-sponsor: Graduate School of Public and International Affairs (GSPIA). A talk by James B. Steinberg, United States Deputy Secretary of State. Is There Any Hope for Global Governance? A talk by Gilles Paquet, Graduate School of Public and International Affairs, University of Ottawa. Free. Registration is not required. This event will be in French and in English. A talk by Ron Deibert, University of Toronto. A talk by Bruce Riedel, Brookings Institution, Washington, D.C. Presented by the Graduate School of Public and International Affairs, co-sponsored by the Canadian Association for Security and Intelligence Studies and CIPS. A talk by Andrew Wilder, Feinstein International Center, Tufts University. A talk by Daryl Copeland, author of Guerrilla Diplomacy: Rethinking International Relations. Authors’ workshop and policy discussion. A lecture by Miguel Ángel Moratinos, Spain’s Minister of Foreign Affairs and Cooperation. Free event, but pre-registration is required: RSVP by clicking here. A lecture by Farhad Kazemi, New York University. A lecture by Susanna Campbell, Tufts University. Co-sponsor: African Study and Research Laboratory.